Much like everyone else in his field, you don’t know Roger Craig Smith’s name, you don’t even know his face, but you know his voice. That’s because Smith is one of the big boys in the world of voice over artists. For almost twenty years, Smith has been lending his diverse vocal chords to some of the biggest titles in animation and video games. Want some examples? How about Sega’s mascot Sonic The Hedgehog? If that doesn’t tickle your fancy, perhaps Ezio Auditore da Firenze from Assassin’s Creed 2 or Chris Redfield from Resident Evil. Or if you like superheroes, maybe you’ve heard of a couple of guys named Captain America (whose lips Smith spoke through in the Avengers Assembled animated series) or a little guy named Batman who he player in the upcoming Batman: Arkham Origins. This week, Smith is the mouth behind the villain in Disney’s Planes and we got a chance to chat with talented voice artist about stumbling into this audio-only acting world through stand up and eventually landing some of the biggest gigs in the business. Comics & Gaming Magazine: How did you get into voice over work? Roger Craig Smith: Well, that didn’t really even enter my radar until I started doing stand-up. It was on the advice of my old high school drama instructor who was kind enough to let me swing by the old school and listen to me do some of my stand-up routine before I got on stage. She said, “Hey you should do some of the voices in your act that you always used to do in school.” So I started incorporating more voices and characters into the act and that’s what people were responding to. They weren’t saying, “we want to book you for stand up” they were saying, “we’d like to represent you for voice over work.” So, I started to think, “maybe I should look into that.” (Laughs) So that’s how it started. CGM: Did you do any impressions? RCS: No, to this day I just butcher impressions. You’re always doing a certain impression of some people, but I was more just taking on the role of characters in my act to sell the jokes and observations. I wasn’t presenting people in a positive light let’s say (Laughs), so I developed a whole series of voices that led straight into this business. CGM: So you’re in Planes and I always wonder if being in a Disney movie something of a Holy Grail for voice over artists. RCS: I can’t speak for other folks but for me, absolutely. Saying it was “A dream come true,” is a cliché, but that hits it right on the head. I was a huge Disney nerd growing up and I still am. I’m an annual pass owner to Disneyland, so to be involved in anything Disney related, let alone playing the bad guy in a Disney feature…I can’t imagine where I’ll go from here. I feel like this is going to be one of those happy accident moments in life where you look back afterwards and go, “how did that happen?” It’s been surreal. CGM: Do you get those Disneyland passes for free now that you’re part of the Disney family? RCS: I don’t know. Could you look into it for me? I think that sounds about right. CGM: Yeah, sure. I’d be happy to. RCS: (Laughs) No, if anything I will continue to give them my money for all those passes. Honestly, it was just so much fun I felt I should be paying them. I was at the premiere last week and finally seeing my character alive and on the screen just made me so proud. I couldn’t believe it, and even though I’m obviously a little biased, I just thought it was an incredible piece of entertainment. And also being an aviation buff, I think they really nailed the excitement of flying and made it surprisingly realistic in so many ways. It’s really cool. CGM: And it must have been exciting to finally play a villain? RCS: Yeah, that was awesome. Even playing heroes is a massive departure from who I am. I don’t even think I could throw Captain America’s shield five feet if given the chance. But yeah, playing a bad guy is just so much fun. I always liken it to as a kid growing up you wanted to be Luke Skywalker, but Darth Vader was the cool character. So it’s weird to say, but being the bad guy in a Disney film is a huge honor (Laughs). He’s not a bad guy in his core, but he’s cocky and that that unfortunately takes him to the dark side to extend the Star Wars metaphor (Laughs). CGM: With Captain America and now Batman, did you come into those jobs as a comic book fan appreciating how iconic they are? RCS: I wasn’t really a comic book fan, but their iconic nature wasn’t lost on me. As long as you were a kid at some point, you know who they were. Not to date myself, but I remember watching the Adam West Batman constantly growing up. I didn’t really know the comics that deeply, but I caught up. The creative director on Arkham Origins sent me a copy of Batman: Year One just to set a tone for what we were trying to draw from as a prequel. With Captain America, everyone knows him from the costume alone. So it wasn’t lost on me what I was stepping into and how passionate the fans are. CGM: Captain America strikes me as being a difficult one to find a voice for because other than the movie there aren’t many live action or animation examples to draw from and he’s kind of just a perfect patriotic boy scout character. That’s what makes him so iconic, but I was curious where you go from there to find a voice? RCS: Well that was one of the things we tried to finesse a lot in Avengers Assemble. He needs to be the leader, but there’s a certain dynamic that takes place between everyone on that team so there’s needs to be latitude and learning curve in there. He couldn’t be such a square jaw that he’d just be a stick in the mud, but he also couldn’t be so casual that he feels too contemporary for someone who is from the 40s. So we played around with it to find that all American innocence without being so by-the-book that he became robotic. There were a lot of discussions to find that place. It was tricky, but we got there. CGM: With Batman, it’s the almost the opposite problem where there are so many different interpretations of the character by incredible actors over the years that I wondered if it was intimidating creating your own version while still falling within what people expect Batman to sound like? RCS: Yeah, it’s a blessing and a curse. There are so many different iterations of the character that have been done. Even Troy Baker who did The Joker in Arkham Origins just did Batman in the Lego movie. I worked very closely with the producers and the directors to find the version of Batman they wanted for this particular game. It was never really about me making a choice. It was about finding what they are looking for. 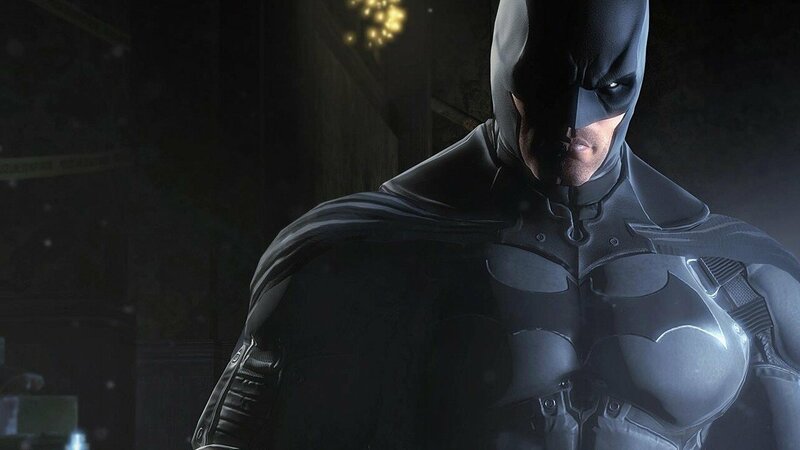 It’s a very collaborative effort and everyone on that game are such fans of Batman themselves that it’s about finding the Batman we all know. I tried to play around with certain things, but you’re always aware of the fact that this is a character who has to be done and you have to be true to that character and make sure that you never go so far outside who he is that people playing the game will go, “oh brother…” Even with the Lego version, it’s a little more kid friendly a fun, but it’s Batman and he has to sound a certain way. CGM: Since this is a prequel to games that Kevin Conroy voiced, did you try to make it sound like a younger version of his Batman at all? CGM: Is it tough on your voice to growl as Batman for hours on end? CGM: One of the characters you’re most associated with is Chris Redfield in the Resident Evil games. I love that series but it’s not exactly known for its rich David Mamet-style dialogue. So I was wondering, did you ever get a line in that series that you just have no idea how to deliver? CGM: And there must be hours and hours of tracks you just grunting and screaming for in-game action? RCS: For sure, that’s one of the rough parts of doing video game work. You kind of have to parcel that stuff out because very often you’re either unable to work the rest of that day or you can’t work for days after that. Any time you have to do battle chatter or grunts-of-effort, we try to schedule that on a Friday afternoon so that you can give it 110%, but then take the weekend just to rest your voice because that can really wear out your voice. CGM: How long do you normally spend recording all of the audio for a game? RCS: It varies, and now especially with companies doing full body capture and facial capture. On Assassin’s Creed we did about three weeks, five hours a day. But that was just voice recording. If you start getting into mo-cap work, you’d be doing 8-hour days at a completely different pace. It really depends on what’s required. I know that Troy Baker was working on The Last Of Us for years and years. But obviously a Sonic game where it’s just the voice will go much faster. CGM: Do you prefer to just focus on your voice or do you like being able to have more control over the final performance through motion capture? RCS: For me, I get a little self-conscious whenever someone asks me to do something with my face. I love pure voice performance and letting the animators come in and take over to add things that I never would have even thought to do. They can finesse a performance to make things better, which ( Laughs) is always great for me. I’ll do it and it’s interesting, but the technology for motion capture requires you to exaggerated your facial expressions to translate to the computer. Sometimes that can hurt the vocal performance because suddenly you’re worrying about whether your raised your eyebrows high enough to read rather than focusing solely on the vocal performance. So sometimes the technology can get in the way a bit.